Jessica Biel talks about her singing, co-stars, and what it was like being the only American in her newest film Easy Virtue at a recent press conference. Q: You’ve done a wide range of films from comedy to action, why did you decide to take on this role? A: I think initially I loved this script. Stephan sent me a copy with a really nice note saying, “I’d love for you to play this part. Please look at it.” So I looked at it and I just thought it was such a unique experience for a period movie. At times it was almost like a raw comedy. It had all these interesting elements—squashing the dog, did that happen in 1929, you’ve never seen it before, but of course it happened. So there were a lot of really unique elements and I just loved Larita. It was one of those things that after I read it, I wanted to be her. I wanted to have the comebacks, the strength, and the vulnerability she had. I literally said to my agents that I had to do this. Figure it out. Q: How did you relate to Larita and what did you have to pull out of yourself that’s very unlike you in order to play her? A: I related to her in that kind of fish out of water feel. I think I always sort of felt that way growing up in general. I went to a lot of different schools. I was always the new kid. You’re on television, you go to college, you’re the kid on television who is in college that everybody knows but you don’t know anybody. So I really connect with her kind of stoic, I’m going to survive in this situation attitude. What was very different for me to grasp were her incredible comebacks which were really clever. I wish I was like that. I’m just too nice that it’s just sooo boring. I want to be more like her in that sense. Q: Are you the type that would get along with the mother or would there be some conflict and button pushing? A: Well see, that’s why I wanted to be a little bit more like Larita because I would probably move it around to make her feel a little more comfortable and not stand my ground as who I am and I’m not going to do what you want and this and that. That’s what I mean about being a little too nice. Q: You sing in this film, what was that like? A: That happened in the middle of shooting. Ben was singing in a scene and Stephan said to him you have such a great voice you should sing the lead track, we want to do Mad About the Boy. What they found out later is that Noel Coward said no man could ever record this song again. I guess he was in love with somebody and that was it, so no man could ever record it again, so you could only find women singing it. Then he heard me humming and he said you should do it. So it was really very random and I hadn’t planned on it, but it was such a treat to get to do that. Nobody really knows this about me but I really started in music with musical theater like Annie and Sound of Music. I wanted to be Whitney Houston– that was my dream. And I don’t know how it took a left turn or what happened, but I just sort of got into this acting world but it was really fun for me to go back and do that. Q: In a recent interview, you said you’ve been trying to get certain auditions and some people have resisted to having you come in the room. Are you at that point where you’re really trying to do every kind of thing that appeals to you and has it been frustrating for you to try to get people to change their image in their head of you? A: I’m always trying to do new and different things, simply for me not to become bored. I want to try something that’s scary or challenging. So yes, I am constantly looking for something hard– what is literally going to scare me to death, ok I should do that. Yeah, sometimes I don’t get in the room, that’s frustrating to not be seen for whatever reason. You just want a shot. It is funny that you do maybe one or two things that are somewhat similar and people see you as only doing that. Everyone is always trying to break out of the last box they were in. If you were in a comedy, you gotta do something different. If you do too many similar things in a row, people’s imagination in this business is just not as open as you would think. Q: Stephan said that everybody has him tied down to the movie The Adventures of Priscilla, Queen of the Desert and he feels very stuck because of it. Did you see that movie and what did you expect from him? Q: One of his tests for actresses is to say one of the crudest, vulgar jokes he possibly can when they walk into the room to see how they react. Do you remember him doing that to you? A: Oh, he’s such a big talker. I don’t think he did that, but he definitely will hit you with some stuff that you would not expect to come out of his mouth. But that kind of person needed to be the director on this type of movie to give it that fresh feel, to give it a unique twist. Q: What was it like shooting in England and working with these British stars? Were you intimidated at all by them? A: I was definitely intimidated by them. I terribly look up to Kristin Scott Thomas. There’s such a natural organic quality to Kristin. I believe that she’s within herself, that she’s connected to the earth in a way. She’s very honest—that’s kind of what I took from sitting across the room with her on the couch and having a scene with her. And I love Colin Firth and everybody there. Initially, I felt like I didn’t fit in and gosh, I hope I’m good enough to pull this off, so it was scary. It is nerve-racking going to live in a new place in a different country. (joking) Thank goodness I speak the language—that makes it a lot easier, let me tell you. You do feel like the outsider. You can’t help it. You’re the American and don’t know what a crumpet is, but it’s kind of invigorating and wonderful and it’s good to get out of your comfort zone. I like to get out of my comfort zone and experience new things. Q: Having done a period piece now, would you have preferred to lived in those times or stay in the present? A: When you’re living it for two months on and off, it’s fabulous, you want to live there, you want to dress in the beautiful glamorous incredible clothes and actually get dressed in the morning to just do anything and have beautiful parties. It just seems so fun and frivolous. But, life was clearly very difficult living back then. Yes it was fun but I much prefer to live now. There were so many restrictions especially for women. It was so difficult to do what you want, to have a career. You really couldn’t do that very easily. Q: Do you handle stress similar to Larita, her solution was to always stay positive? A: Definitely. I’m very positive and I feel like I handle stress very well. I just kind of let things roll off and always look to what can I find positive in a situation and how can I resolve it in a logical way. I’m probably not as cool under pressure as she is. My heart would be pounding a million miles per hour if I was having a confrontation like she was having with her mother-in-law, but I definitely can see the positive and get through a tough situation pretty well. Q: What do you think about Justin’s (Timberlake) job on Saturday Night Live and about his acting ability? A: I think he’s fantastic on SNL and he can do anything he puts his mind to. Q: You worked with Patrick Swayze on Powder Blue. Can you tell us what it was like to work with him, especially since a lot of people are concerned about him right now? A: He’s definitely beloved for me because I grew up watching Dirty Dancing. I watched it every day after school. I’ve probably seen it eighty times, no joke. He was wonderful. He was involved in the process and literally came to set when he wasn’t even working and came to our director to say ‘here are my scenes for tomorrow. I’ve rewritten everything, what do you think?” He’s just so kind and such a warm supporting person to work with. Q: You look like in the film that you were born to wear those clothes from that period. Did you feel that way when you were wearing them and have you adopted any of the styles? A: I definitely did feel wonderful in those clothes everyday. But the thing is that those clothes were made for women’s bodies. They were built to accentuate your waist and give you room in the hips and legs and wear loose beautiful satin silk blouse. It was just such a wonderful time for women’s clothing to suit a woman’s body. Q: Were you a fan of race cars before playing this role or are you a fan now? A: No, not really. I’m not really into cars and speed in that sense. It was pretty wonderful to drive that car though, That car was a beauty, she was something really special. Q: What was it like riding the motorcycle and doing the Can-Can dance? A: I didn’t actually ride the motorcycle. I love doing my own stunts and I requested to do it but the insurance wouldn’t allow it. The Can Can is so hard that is a really aerobic dance, it’s relentless with the knees up to here and the abs. It’s pretty serious and it was really fun though. That’s one of my favorite scenes, the first time I saw that and Kimberly with her skirt, it kills me every time I see that. Q: The tango scene is such a great one. What was the training process for that like? A: If you can believe it, we literally had three or four rehearsals. Colin and I danced together probably three or four times. And I don’t know how we did it, that is a very difficult dance and it’s very sensual. Most of all we wanted to create that feeling of sensuality and mystery which is what it is but we couldn’t cross the line in any sense because of the relationship we had in the movie. But it’s an incredible dance and I wish that I had kept taking classes because it’s so much fun. That was my first tango experience. Q: Amelia Earhart was one of the role models Stephan wanted you to have in mind. Is that important to you, even though you weren’t playing her, somebody you could look at their pictures or play their attitude? A: It’s usually not one person in particular. For this one it was Amelia, Katharine Hepburn, and a couple of other women from that era that was sort of watching their stuff and listening to their voice and just how they delivered their sarcastic amazing put downs with a smile. So it is helpful especially when you have to embody this person in a different time and the speech is different and how do we do that without it being an affected speech. Q: God forbid that you have such a terrible mother-in-law like you did in this movie, how would you deal with someone like that? A: I think there are two ways of thought on this one. You just be confident being you and if you don’t like me, then you don’t like me, too bad. Or you kind of do what Larita did and you try and I think that’s what I would do. I think I would give my best effort to try to be accommodating and respectful but I would definitely maintain my integrity of who I am and not going to be pushed around by someone which is in a ridiculous sort of scenario. But I also don’t think I would start a war with someone’s mother. Q: Have you ever had any friction with the relatives of anyone you’ve dated? A: Oh sure. A long long time ago. You can’t please everybody and I think you have to remember that. 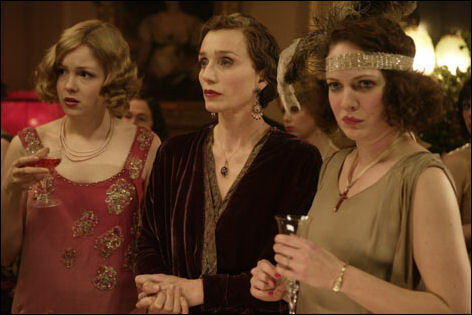 Easy Virtue is a Sony Pictures Classics release and opens in theaters on May 22, 2009. Be sure to check out exclusive clips from the film here.